During the middle 1990's many Flying Triangles were seen near the city of Derby in the United Kingdom, some 110 miles NNW of London. This was well documented by Omar Fowler of the Phenomena Researh Association in his Flying Triangle Mystery. Approximately 30 miles to the north of Derby is the city of Sheffield. It was near here on March 24, 1997 that a major Flying Triangle incident occurred with the possible crash of a RAF Tornado fighter jet during a chase of a Flying Triangle. This was well researched by Max Burns and documented in The Sheffield Incident Parts 1,2,and 3, A Flying Triangle Incident. My concern here is the many reports of Flying Triangles (FT's) at and near the city of Derby. Over the last several years there have been many reports of FT's near Nuclear Power Stations such as Sizewell and Bradwell east of London. I just had a hunch that there was a major nuclear facility at Derby and hench the many sightings of FT"s. I did a little research on the internet and did find a major one time secret nuclear facility in the city of Derby. It is the Rolls-Royce Raynesway plant that processes radioactive material for the Trident Submarine. What happens at Rolls-Royce Raynesway (RRR)? The RRR designs, supplies and supports all the Pressurised Water Reactor (PWR) systems and equipment which power the Royal Navy’s submarines, including Trident. They have supplied all the Royal Navy’s nuclear submarine reactors for 50 years. There are 2 licensed nuclear sites at RRR – the manufacturing plant and also the Neptune test reactor. Elements are made at the manufacturing site with enriched uranium and zircaloy. These are assembled into core modules with other elements manufactured from burnable poisons. Control rods used to control the reactor reactivity and to shut the reactor down are also manufactured here. The plant also manufactures steel components for control rod mechanisms, valves and other specialist components. Regulation is done by the NII (Nuclear Installations Inspectorate). Inspections are quarterly and there is an annual demonstration exercise to test the emergency arrangements – the most recent test exercises showed what they call “learning points” although they were satisfied that RRR would have coped had the incidents been real. Liquid and gaseous discharges from the plant are authorised by the Environment Agency, and RRR admits that they cannot entirely prevent radioactive emissions to air and water. One of the biggest areas of high level waste production by RRR is the radioactive nuclear reactors themselves when they reach the end of their life, and as with civil nuclear reactors, there is no effective disposal mechanism in existence. 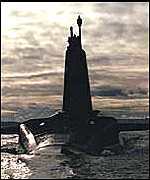 The venting of irradiated Tritium and Carbon 14 from the Trident submarines into Plymouth Sound, and a nuclear accident in a waste site at Dounreay some years ago are both associated with RR. Please note FT denotes Flying Triangle. As Mr Raymond Spybey walked down Oxford Street in his hometown of Long Eaton in Nottinghamshire he noticed what appeared to be "lights in the distance". The time was 18.55 on the night of February 4th. He took no notice of the lights at first until he realised they were stationary. "When I stopped walking they came towards me, then when I started walking again 'it' stopped. The next thing I knew was that the lights were above me and I could make out that the shape was triangular, with yellowish lights at each angle and one in the centre; there was a little red light on one of the sides. Then I lost sight of it over some factories and although I made for a nearby bridge, to get a better view, when I got there, it had vanished." "I remember that I heard a faint humming sound as it was moving, but when it stopped it was silent. I could clearly see that it was a black triangle craft and it was about 400ft up. It appeared from the North and disappeared heading in a NW direction." Littleover, Derby 2-3 97 On the night of March 2 1997, a Mr B.M. of Littleover, Derby decided to go outside to his car and switch on his car alarm system. The time was 19.55. He continues with his story: "It was a clear night and I noticed how bright the stars were, I noticed the flashing lights of two aircraft in the distance, over towards Castle Donnington." (East Midlands Airport). "Then I looked around and as I looked straight above me, I saw a triangular shaped object come from above me and travel quickly towards the SE. I looked at this triangle several times, before my mind registered what I was seeing. The FT seemed to be heading towards the aircraft, as if to go under and between them. Then I lost sight of the object, as it disappeared in the night sky." "There was no noise whatsoever from the FT and it carried no lights. It travelled in a straight line with the point of the triangle going first." That same evening, a Mr Steve Gamble had been travelling towards Long Eaton, (just a few miles to the south east of Derby), when he saw a lightening flash in the sky. Then he saw something like "a golf ball of light flash across the sky!" Also that evening Pauline Cooper of Derby, reported seeing a bright light moving across the sky at about 19.30. 7/3/95 20.25 Witness Mr Keith Thompson reported that he had been watching two FT's through his binoculars from his home in Repton (near Derby). He had been able to make out a number of red, green and white flashing lights. Shortly afterwards a FT flew over his house causing his TV picture to distort (seen by his wife) and he noticed that his map compass had fluctuated. He also commented that the FT had moved with a "jerky, stop-go motion." "We were on our way from Willington to Swarkstone and we had just negotiated a right hand bend in the road, when we saw a very large triangular object coming directly towards us. I said to my brother, what on earth is that?" "I noticed that it had approximately nine, large, three dimensional light panels, like blocks of white light, underneath the aircraft. They were very bright and made it difficult to distinguish the exact outline, once it was overhead, but then it appeared to be a type of delta wing. We stopped the car and got out for several minutes. We heard a sound like jet engines and we could only think that it was a type of aircraft used for night surveying of some sort. However, it was so cold, we got back into the car and watched it until it went out of sight behind some trees, heading for Swarkstone. We couldn't understand why, if it was a military aircraft, it had such a large block of lights underneath." 16/3/95 19.15 Mr Keith Thompson (an ex-military person and keen observer), reported that he had seen unusual lights over the Littleover area (near Sinfin), Derby. Mr Thompson had spent many hours searching the sky with binoculars since the FT 'flap' began in December 1994. He also managed to capture the lights with his video camera. "I looked, I really looked! I know in my mind that I saw it. There were cars behind me and one vehicle to the right of me, I couldn't possibly be the only person to have seen it." Three witnesses at Ilkeston, Derbyshire watched a FT stationary in the sky, covered in 'stars' with a red light adjacent to the white 'nose' light. It was observed for over half an hour. A witness described it as follows: - "The object was roughly triangular, with many projections, as though three stars had been pressed together. It was less than a mile away and about 500ft high, my estimate is based on known comparisons. It was far brighter than any star and in the top left hand corner there was a small red light." 21/1/95 10.55 A female witness, together with her twin daughter's (10) observed a large grey FT while driving home in Derby. The FT was seen hovering over the Derwent Housing Estate. It appeared to have 'rounded' corners (see Belgian FT) and had a series of bright red lights around the edges of the craft. 22/2/95 20.00 A witness, Mr R.C. had just returned to his home in Mackworth, Derby, when he observed two FT's with numerous lights. They were stationary at first, but then began to move towards the witness. He heard a 'humming noise' as they passed slowly overhead. He noticed that his dogs were nervous. A second person at Mackworth also witnessed this incident (there were three independent witnesses). A Mr Mark Purvis saw two bright lights approaching his house. He was able to make out the shape of two FT's as they passed overhead. He also heard a 'humming' noise and commented on that his dogs snapped at each other nervously. 26/2/95 21.40 Mark Cheetham / Tracey While travelling from Matlock, on the Moorwood road near Southingfield, Derbyshire, Mark Cheetham and his girlfriend (Tracey), noticed a light in the sky that they at first took to be an aircraft. They were driving in the direction of the light that they estimated to be about a mile away. They were becoming increasingly curious and were soon close enough to establish that the light was not moving, but hovering quite low. It was at a height about 200/300ft from the ground and close to a nearby cottage. Mark told his girlfriend that he was determined to find out what it was and he turned the car down a road heading towards the cottage. Tracey was now becoming very frightened and Mark slowed the car down to about 10mph. Finally he pulled the car to a halt when they were about 75 yards away from the lights. The lights were hovering motionless, about 200ft to the left of the cottage. Mark and Tracey peered out into the night and Mark asked his girlfriend what she could see. Both agreed that the object had three red lights in a triangular formation of about 40ft in diameter, with two round white lights the size of an old dustbin lid in the centre of the craft.Then the craft started to move towards them, at a speed of no more than 20mph. It took only 30/45 seconds before it was directly over the car! "Tracey was screaming at me to drive off but all I could do was sit there and watch it, until it was overhead and out of my vision by then I was getting really worried, so I started to drive off. At this point at this point I asked Tracey where it was and she said it went straight up and disappeared in the direction of Tansley. The following incidents reported by several witnesses relate how on the 1st March 1995 there was progressive FT activity throughout the day in the area of the A52 Derby to Ashbourne main road. This appeared to be a day of intense FT activity in the Derby area, although FT incidents were reported several days before and after the 1st March 1995. 1-3-95 03.30 Pete, a witness at Kirk Langley (a village on the A52 Derby to Ashbourne road) reported that in the middle of the night he heard a noise "It sounded like a washing machine." He saw bright orange lights reflected in his bedroom, he looked out of his window but saw nothing. He commented "Strange things happen around here, there are lights that are not lights." 1-3-95 05.50 A Mr D.W. was driving on the A6 (approx. 3 miles East of Kirk Langley), from Derby to Belper when he saw a vivid bright light in the sky. The witness was driving alone at the time and he was unable to give a clearer description, other than seeing a bright hovering light in the sky. 1/3/95 18.50 A Mr B and his partner were travelling in their car on the busy A52 Derby to Ashborne road. They were a few miles out from Derby and heading Northwest, when they noticed a bright light in the sky above them. As they drew closer they were aware that the traffic was slowing down. They were then able to see the reason for the traffic delay. The bright light was in fact a series of lights in the shape of a flying triangle and the FT was hovering low over the main A52 road. The traffic had slowed down to a crawl as drivers peered up, looking at the brightly lit FT. "It was so low that you could not fail to notice it." commented Mr B. "I cannot understand why other drivers did not report it." Though they had. Another driver Mr Hutchinson was also driving along the A52 Derby to Ashbourne road at that time and reported seeing a FT with red and green lights around it. A Mrs A. H. reported that during the same early evening, she had also been driving along the A52 Derby to Ashbourne road. Suddenly a bright global object with a series of white, red and green lights and a"triangular" base had zoomed by close to her car and then "vanished out of sight." Derby (Rolls-Royce Aero Works) 29/6/94 In the early hour's (01.20) of the 29th June 1994, Mr Alan Beardmore was driving his van on his way home from a snooker tournament. His journey took him past the engine testing facility of the Rolls-Royce Engine Company. On one side of the road there is a series of large concrete buildings and on the other there is open countryside with a series of electrical pylons carrying to the test facility. As Mr Beardmore was driving along his van headlights went out and almost at the same time he noticed a series of lights hovering over a nearby field. He pulled to a stop and peered out of the window, everywhere was deserted apart from a formation of three bright white lights hovering over a nearby power line pylon. The witness was able to make out what appeared to be a triangle of lights and close to the 'nose'; he noticed a bright red light, which was positioned next to the bright white light. Mr Beardmore looked through the side window of his van and peered into the darkness. He was just able to make out the classic FT shape then as he watched it started to move away. He turned his van around to follow the FT, but it was now out of sight then suddenly his headlights came on again! He surveyed the sky and had one last look for the FT, but it had gone. Campaigners are demanding the closure of a "secret" nuclear fuel plant, based in the heart of a British city. The move comes after the operators, Rolls-Royce, confirmed it had been warned about serious safety flaws at the factory in Raynesway, Derby. 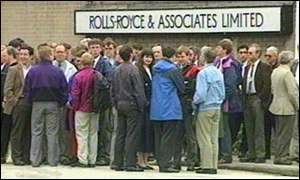 The BBC's Linda Duffin: "Rolls Royce have since changed their procedures "
The Sunday Times says the company is processing fuel even more volatile than the material that sparked a nuclear scare in Japan last month. Highly enriched uranium fuel is treated in a special wing of Rolls-Royce's plant. It is delivered by the Ministry of Defence (MoD) and, after treatment, is used in Royal Navy nuclear submarines. The Sunday Times says it has seen leaked Rolls-Royce documents that admit there is a risk of a "criticality accident" similar to that which caused the disaster at the Tokaimura plant in Japan last month. In that incident radioactive clouds drifted over several inhabited areas after a nuclear fission chain reaction. 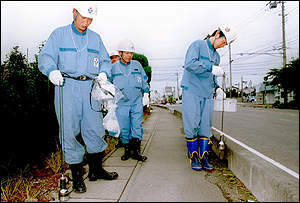 Three workers were seriously injured and a further 36 contaminated after the radiation leak. The fuel involved was 20% uranium 235 but at Derby it is reportedly 90% uranium 235. A Rolls-Royce spokesman said the Nuclear Installations Inspectorate (NII), part of the Health and Safety Executive, had found flaws in its safety procedures during an exercise in March. He said: "We have now clarified the position, changed our procedures and practised them three times." He added: "Last week we had an emergency exercise involving the emergency services which was observed by the NII. "Afterwards, the NII said it was now satisfied with our procedures." Defence Secretary Geoff Hoon said the plant should not be closed. "Those concerns have been addressed by the Nuclear Installations Inspectorate and they've given the plant an entirely clean bill of health. "Those concerns have been thoroughly investigated." A Health and Safety Executive spokeswoman said there had been safety concerns at the plant. She said: "There was an emergency exercise in March following which we asked for some improvements and a repeat of the exercise, which took place on Wednesday. The Sunday Times says the city's 223,000 residents were unaware of the factory's clandestine role because it was "classified". The factory's main role is as a manufacturer of engines for Trident nuclear submarines. As such it is highly sensitive, and lorries are often escorted into and out of the plant by armed guards. Derby also has no emergency plan in case of a nuclear leak, reports the paper. Dave Knight, chairman of the Campaign for Nuclear Disarmament, called for the Raynesway plant to be closed down immediately. He said: "Urgent answers are needed to some very serious questions. William Peden from Campaign for Nuclear Disarmament: "It's an unsuitable operation to have in the centre of Derby"
"Why is there no emergency plan? Are there any containment procedures for a critical accident? The people of Derby have the right to know. "As Tokaimura showed, accidents do happen and when they do the effects are long lasting if not deadly for the local populace." 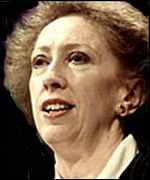 The city's MP, Margaret Beckett, a former Cabinet Minister and currently Leader of the House of Commons, is expected to raise the matter with the new Defence Secretary Geoff Hoon. The revelation that a Rolls-Royce plant in Derby processes radioactive material has prompted shock and concern among local residents. They knew the plant in Raynesway, Derby, made propulsion systems for nuclear submarines - but the delicate operation of processing highly-enriched uranium had been classified until now. Local councillor John Ahern, whose ward covers the plant, promised to investigate reports of serious safety flaws at the factory. He said: "I am extremely concerned, but let me say that if there has been a breach in safety I will address the issue. "I owe it to my constituents, the people of Derby, and the workers, to get to the bottom of this. I will be speaking to the powers that be to discover just what has happened." He added: "There are some serious questions that need to be asked. I am sure the people living near here will be equally concerned. "We need to seek clarification that this area is safe and that there are not any health problems as a result of this." Shoppers at Derby's Asda supermarket said they were surprised and worried by the discovery. Mother-of-two Alison Jones, from Allenton, said: "It is very worrying, especially after what has happened in Japan. We need to know what is happening." Another shopper said: "I think it's disgraceful. It is very worrying for people who live nearby."